It was a proud day Monday when the kids graduated from high school (tears and sniffles, etc. 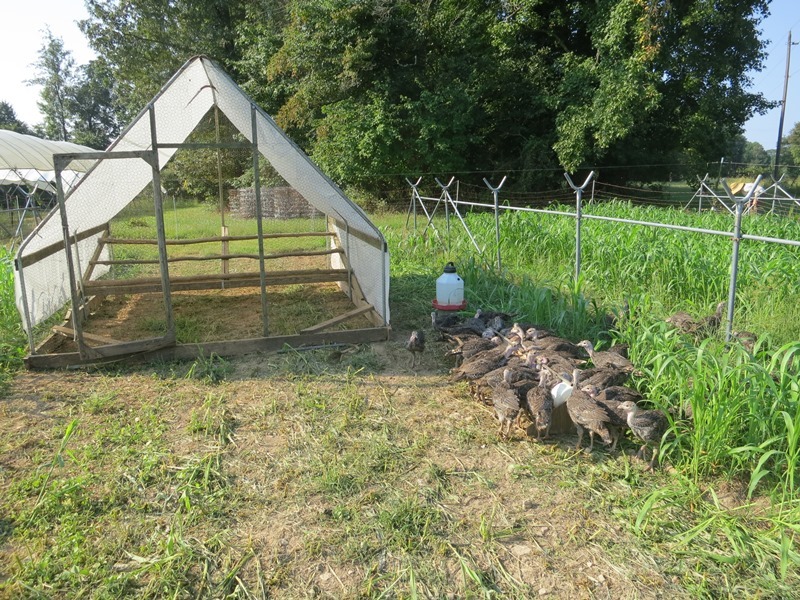 ), I mean the turkeys moved from the brooder to the field. Fully six weeks old, not sure how old that is in human years but more than ready to need more room to roam. A different first move this year because we are raising them much later in the season than we have for the past 10 years. Usually their first move is down below the hydrangeas and viburnums so they have more shade and shrub protection from potential flying predators. Over the following 10 weeks they move up hill through the blueberries and various fields of either old cut flowers or summer cover crops, changing fields every two weeks or so. This year we only have a few weeks left until we start tearing up all the fields, that are now finished for the year, in preparation for winter cover crops, so there is no time to rotate the birds in the usual pattern if we want them drop some poop on at least some fields. So this year they are starting at the top of the hill instead. The good thing about the first stop on the turkey tour is it was a shorter walk for the birds from the brooder to the field, yes they walk, slowly, very slowly (here is a picture from last years walk). Fewer distractions along this grassy walk and after not too long we had them in a lush green summer cover crop of sudangrass with lots of shade and bugs to eat. A successful start for some happy birds. Look for the turkey reservation form and information next week. Only two weeks left to get your tickets for the Carrboro Farmers’ Market Chefs’ Harvest Potluck, Thursday September 26th. If you attended last year you know how great an event it was, if you didn’t then don’t miss out on this one. Many great dishes from over 20 local chefs and beer from Six String Brewery and wine from Benjamin Vineyards. It is a beautiful event under the market pavilions that raises money for improvements to the Market facility. See you there! The flower department is down to the fall line-up. It is all about Celosia in all its intense colors and shapes. More fall Lisianthus and rumor of Bouquets. Definitely fewer sweet peppers this week but still plenty of Red Bells and of Red, Yellow and Orange sweet Corno di Toro’s. Rounding out the sweet peppers are Purple Bells and Cubanelles. In hot peppers a fair amount of Anaheims but the demand and special orders have been huge. Lots of Poblanos for stuffing and other uses. In the rest of the hots we have Passillas, Jalapenos, Serranos, the first of the Picante Pimentos and Cayennes. In not or rarely hots more of the Aji Dulce (the habanero without the heat) and the appetizer Japanese Shishitos and Spanish Padrons. Some more Radishes and sweet and tender Japanese Turnips. Sweet Red Onions. Still some nice Basil. A few more Italian heirloom Eggplant.